Blue Mountain Flower is harvested from the blue-flowered variety of mountain flower. Other varieties of mountain flower yield purple mountain flowers, red mountain flowers, and yellow mountain flowersDG, but the flowers have different alchemical properties. The blue, purple, and red mountain flowers are commonplace in the foothills and lower elevations of mountains (below the snowline). 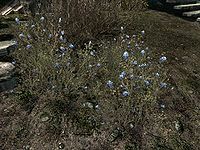 Blue mountain flowers and wheat contain both Restore Health and Fortify Health effects, allowing easy creation of dual-effect potions, especially since both ingredients are commonplace. They can be used in conjunction with a blue butterfly wing and a giant's toe to create the most valuable (monetarily) mixture in the game. This page was last modified on 3 June 2018, at 17:28.